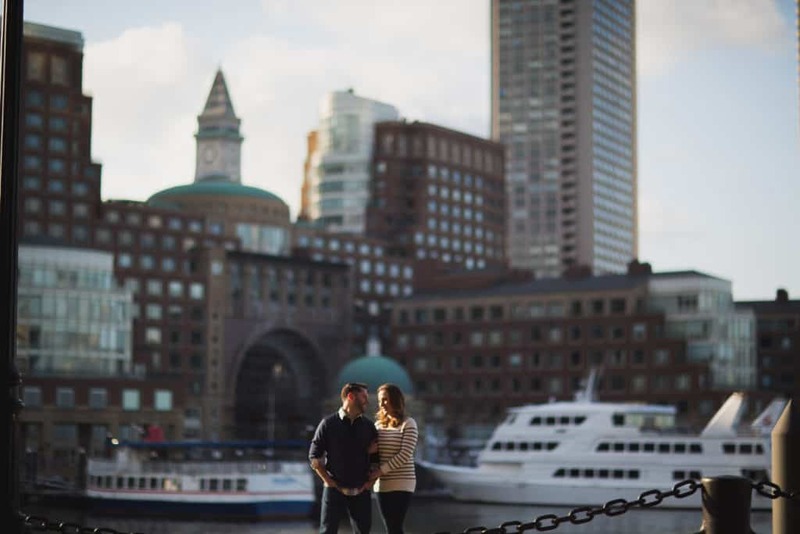 Here is a list of some of my favorite Boston engagement shoots locatinons. If you and your fiancé are looking for inspiration. If If you’re looking for an iconic location for your photo shoot, it can’t really get better than the Public Gardens. Maybe it’s where you had one of your first dates. Maybe you have wonderful memories of walking through the park, holding hands. Either way, this is the perfect place to capture a little bit of nature in the heart of the city. There is no best time of the year for this location because each season has something different to offer! Whether they’re covered in a blanket of snow, or the trees are full of leaves, the Public Gardens are beautiful year round. In the same way that the Public Gardens are iconic, so is the Boston Common for many of the same reasons. This is the perfect place to come if you want to people watch, ice skate or just walk around. No matter the time of year, there is always something happening here and you can count on finding the perfect location for your pictures. This place is a winner! Are you a fan of beautiful architecture, cobblestone streets and history? This location is perfect for you! Beacon Hill is, without a doubt, a timeless classic. There’s a reason why it’s one of the most photographed places in the city. The fall offers gorgeous foliage and the perfect opportunity for cozy images. Since this is also a quieter part of the city you won’t have to be nervous about having too many onlookers. In any case, Beacon Hill is amazing in every way. And the best part? After we’re done taking pictures, I’ll show you where to get an out of this world hot chocolate! 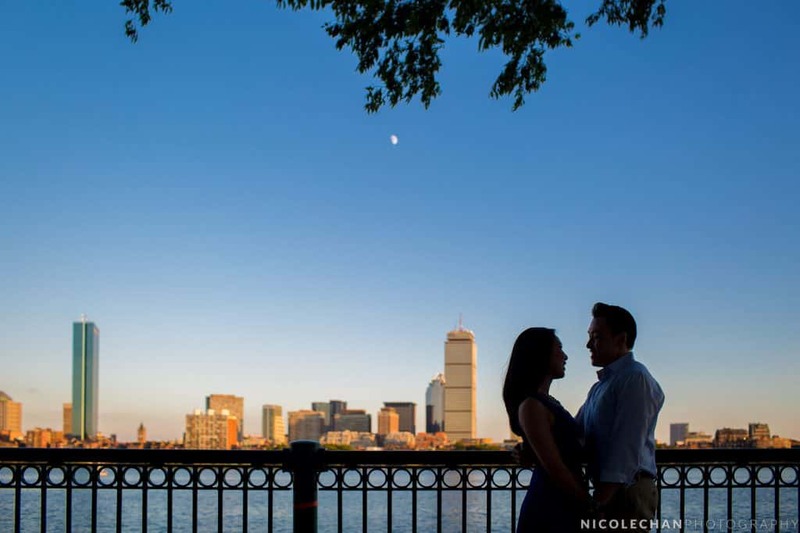 The Charles River Esplanade is an amazing spot for pictures! Not only is the river great, but also the backdrop of the city on both sides of the shore. This location is best chosen for late spring and summer shoots when the grass is green and the trees are luscious. There are plenty of benches to choose from right along the water. We can also make our way to one of the wooden decks that jut out over the river. It’s the perfect place for a long walk and some quality time with your partner. The Esplanade never disappoints! If you are having your engagement shoot in Boston because you’re in love with the city, this is one of the best places to be. Fan Pier is another one of the most photographed spots in Boston, just because it captures such an iconic view if the city. Right on the water, you can have downtown Boston serve as your backdrop. This is a perfect spot for a day in the spring, summer or fall. Right around sunset, when the light softens, all the lights inside the skyscrapers turn on. On the edge of Chinatown, the financial district and the North End – Fan Pier is easy to reach from all sides! 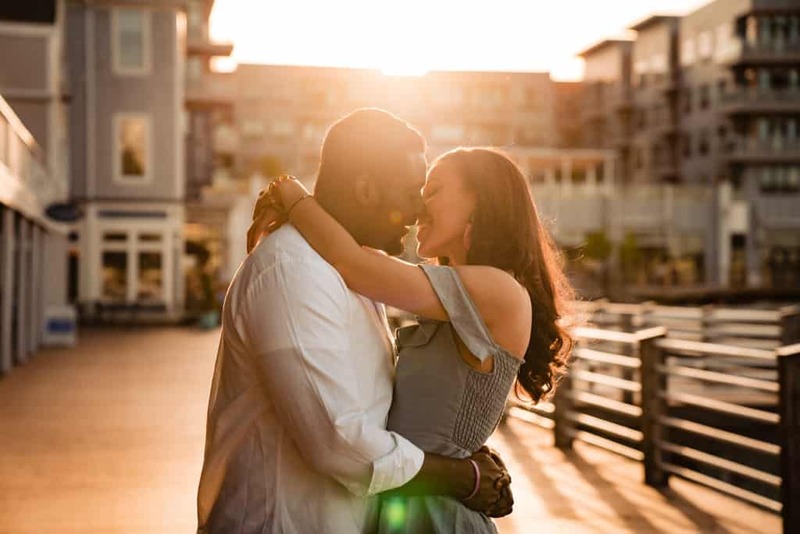 My most recent engagement shoot started off right here! This park is right on the waterfront, on the outskirts of the North End and Faneuil Hall. It’s perfect thanks to its central location which allows us to move to a lot of different spots close by. The park itself is an attraction because of the trellis that runs through it. In the summer, it’s covered in luscious vines and flowers – in the winter, it’s coated in colorful lights. 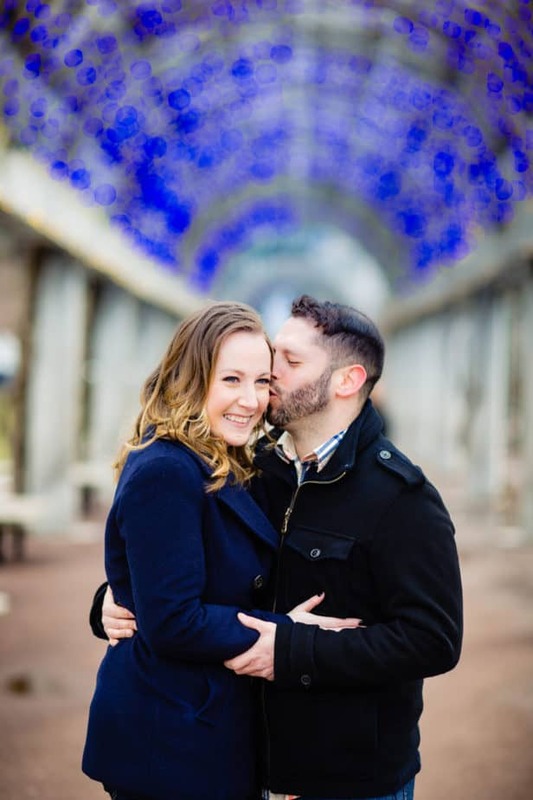 If you want your engagement shoot to have a special holiday feel, this is the place for you. Any time of the year works for this location because the trellis always has something to offer. If you’re looking for something a little different, a little off the beaten path, here’s my secret. I grew up in an area of North Quincy and frequented a tiny area with a view of the city skyline, a small private beach, a charming boardwalk, and some beautiful greenery. There’s easy parking. It’s 15 minutes drive away from the city. I take my dog there all the time. Very few photographers are there. It’s called Marina Bay. Even with the name, I know of a handful of little nooks and crannies that not many other photographers know about. I love it here and would be happy to share it with you.